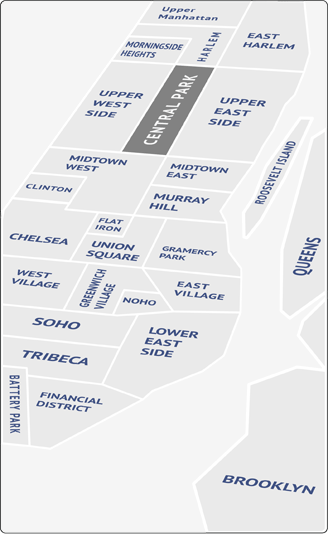 The Financial District includes everything below Chinatown and Tribeca to the southern tip of the Manhattan. The home of Wall Street, this neighborhood used to turn into a ghost after the closing bell rang at the stock market. But a steady increase in residential space has turned the Financial District into a bonafied neighborhood, complete with bustling with shops and restaurants that cater to the growing fulltime population. Investment bankers and stock brokers alike love being able to walk to work, and for those with jobs further north, the subway access can’t be beat. Many of the Financial District’s residential buildings are converted office spaces. A large percentage of these are doorman buildings boasting hotel-like luxuries, including private gyms, parking garages and best of all, incredible views of the Hudson and East Rivers. Catering to its finance world clientele, the neighborhood has a good collection of established, high-end restaurants like the venerable Giovanni’s Atrium, the Original Delmonico’s Steakhouse Restaurant, Fraunces Tavern (since 1762), and Cipriani Wall Street. The Financial District is home to the South Street Seaport, with spectacular views of the Brooklyn Bridge and the harbor, as well as waterfront shops and restaurants. Open-air concerts are also held here. Walk through the side streets which are entwined with 18th century history together with modern public artworks such as Fritz Koenig's “The Sphere”, which once stood at the center of the plaza of the World Trade Center, Jean Dubuffet’s “Group of Four Trees” and the “Object in Five Planes” by Alexander Calder; or have a beer at Faunces Tavern and stand where Gorge Washington stood in the famous Long Room of 1783 where he bides farewell to his trusted & dedicated officers after America won the Revolution! In addition to browsing South Street Seaport, there is Battery Park, at the southern tip of Manhattan, with unbeatable views of the Statue of Liberty and Ellis Island. At the north end of the park is Castle Clinton, Pier A, formerly a fireboat station; and Hope Garden, a memorial to AIDS victims. Along the waterfront, ferries depart for the Statue of Liberty and Ellis Island, and there is also a New York Water Taxi stop. The park is also the site of the East Coast Memorial which commemorates U.S. servicemen who died in coastal waters of the western Atlantic Ocean during World War II, and several other memorials. With the massive reconstruction of the World Trade Center area, this part of Manhattan can only get better.